A 74 year old woman with no smoking history and no previous history of malignancy presents with a solitary left upper lobe, PET+ mass. Wedge resection demonstrates a 4.0 cm mass consisting mostly of invasive acinar adenocarcinoma. Scattered throughout the tumor there are areas of lepidic (bronchioloalveolar) growth pattern. In addition, there is diffuse neuroendocrine cell hyperplasia. 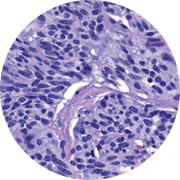 Some of the hyperplasia is associated with the lung adenocarcinoma and some with the surrounding non-neoplastic lung tissue. Two foci of neuroendocrine cell hyperplasia measure 0.5 cm and are therefore classified as carcinoid tumors. Immunoperoxidase stains for TTF-1, Napsin A, chromogranin, synaptophysin, and CD56 highlight areas of adenocarcinoma, neuroendocrine hyperplasia, and carcinoid tumors.